You are here: Home / Mortgage / Fort Mill Mortgage Rates, Is There A Major Mortgage Rate Drop On The Horizon? 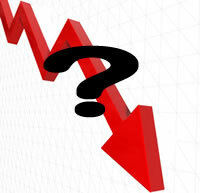 Fort Mill Mortgage Rates, Is There A Major Mortgage Rate Drop On The Horizon? Maybe, but if you aren’t ready for it you might miss out! The Fed just cut their rate by 1/2 point but mortgage rates are still rising. The stock market is getting it’s teeth kicked in, but mortgage rates are still rising. Inflation has moderated and even energy prices have started to decline, but mortgage rates are still rising. WHAT IS GOING ON??? Mortgage rates are controlled by mortgage bond prices and even though all the stars are aligned for fearful investors to gobble up mortgage bonds, many investors are not confident in any type of mortgage paper right now. Mortgage has become a four letter word to investors, and if mortgage bonds aren’t doing well… Mortgage rates will rise. The Good News: At some point in the near future, if confidence in mortgage bonds is revived and market conditions remain the same, mortgage rates should drop like a rock! With the stock market down and investors looking for a safe bet, mortgage bonds have been the investment of choice in the past. If we can get through this troubled times, we should see some very low rates in the near future. When rates drop hard, they typically go overboard and hit some ridulous low rate for a day or so. If you aren’t ready to lock in right away, you will miss out. If you would like to be prepared to take advantage of some record low rates, give me a call at 980-721-7478. If rates don’t drop, you have nothing to lose. If rates do drop soon, you could be ready to pull the trigger and save thousands! Olan has recently started his own mortgage blog. If you are looking for more mortgage tips and information, check out his new blog at http://charlottemortgageonline.com/.